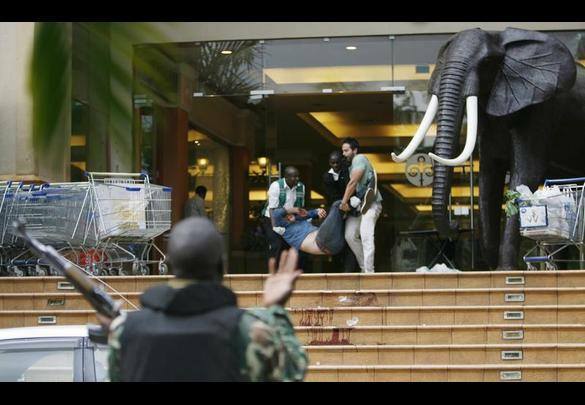 NAIROBI, Kenya (AP) – Kenyan security forces launched a “major” assault late Sunday on the upscale Nairobi mall where an unknown number of hostages are being held by al-Qaida-linked militants, in an operation officials said would end the two-day standoff that had already killed 68 people. The assault, which began shortly before sun down, came as two helicopters circled the mall, with one skimming very close to the roof. A loud explosion rang, far larger than any previous grenade blast or gunfire volley. Kenyan police said on Twitter that a “MAJOR” assault by security forces was ongoing to end the two-day siege. “This will end tonight. Our forces will prevail. Kenyans are standing firm against aggression, and we will win,” Kenya’s Disaster Operations Centre said on Twitter. The assault came about 30 hours after 10 to 15 al-Shabab extremists stormed the mall from two sides, throwing grenades and firing on civilians at will. Loud exchanges of gunfire emanated from inside the four-story upscale mall, throughout the day Sunday. Kenyan troops were seen carrying in at least two rocket propelled grenades and helicopters hovered throughout the day. Al-Shabab militants reacted angrily to the helicopters on Twitter and said the Kenyan military action was endangering hostages. Kenyan officials said they would do their utmost to save hostages lives, but no officials could say precisely how many hostages were inside. Kenya’s Red Cross said in a statement citing police that 49 people had been reported missing. Officials did not make an explicit link but that number could form the basis of the number of people held captive. Somalia’s al-Qaida-linked rebel group, al-Shabab, claimed responsibility for the attack that specifically targeted non-Muslims. The attackers included some women. The Islamic extremist rebels said the attack was retribution for Kenyan forces’ 2011 push into neighboring Somalia. Al-Shabab said on its new Twitter feed – after its previous one was shut down on Saturday – that Kenyan officials were asking the hostage-takers to negotiate and offering incentives. “We’ll not negotiate with the Kenyan govt as long as its forces are invading our country, so reap the bitter fruits of your harvest,” al-Shabab said in a tweet. Kenyan President Uhuru Kenyatta reiterated his government’s determination to continue fighting al-Shabab. He said although this violent attack had succeeded, the Kenyan security forces had “neutralized” many others. Earlier in the day Kenyatta said he his nephew and his nephew’s fiance were killed in the attack. Former Kenyan Prime Minister Raila Odinga told reporters at the mall that a number of people were being held hostage on the third floor and the basement area of the mall, which includes stores for Nike, Adidas and Bose stores. Kenyan security officials sought to reassure the families of hostages inside but implied that hostages could be killed. The security operation is “delicate” because Kenyan forces hoped to ensure the hostages are evacuated safely, said Interior Cabinet Secretary Joseph Lenku. “The priority is to save as many lives as possible,” Lenku said, adding that more than 1,000 people escaped the attack inside the mall on Saturday. “We have received a lot of messages from friendly countries, but for now it remains our operation,” Lenku said. Westgate Mall is at least partially owned by Israelis, and reports circulated that Israeli commandos were on the ground to assist in the response. Four restaurants inside the mall are Israeli-run or owned. Israel has close ties to Kenya going back many years. And in recent years, Israel has identified East Africa as an area of strategic interest and stepped up ties with Kenya and other neighboring countries, due to shared threats posed by al-Qaida and other extremist elements. In 2002, militants bombed an Israeli-owned luxury hotel near Mombasa, killing 13 people, and tried to shoot down an Israeli airliner at the same time. Kenyans and foreigners were among those confirmed dead, including British, French, Canadians, Indians, a Ghanaian, a South African and a Chinese woman. Kofi Awoonor, a Ghanaian poet, professor and former ambassador to Brazil, Cuba and the United Nations, died after being injured in the attack, Ghana’s presidential office confirmed. Ghana’s ministry of information said Awoonor’s son was injured and is responding to treatment. Kenya’s Red Cross said the death toll on Sunday rose to 68 after nine bodies were recovered in a joint rescue mission. Kenya’s presidential office said that one of the attackers was arrested on Saturday and died after suffering from bullet wounds. Britain’s Foreign Office said that Foreign Secretary William Hague has chaired a meeting of Britain’s crisis committee and sent a rapid deployment team from London to Nairobi to provide extra consular support. 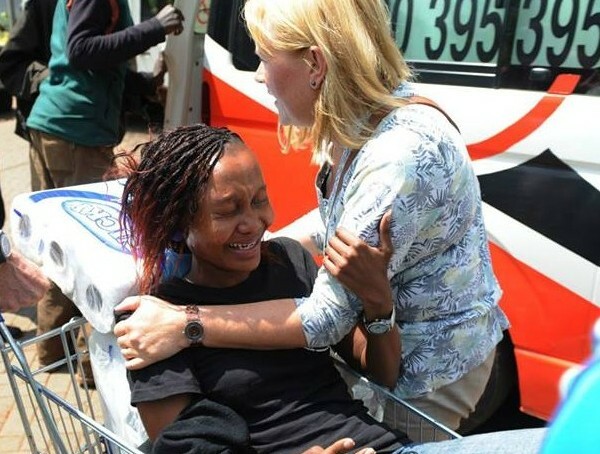 The United Nations Security Council condemned the attacks and “expressed their solidarity with the people and Government of Kenya” in a statement. 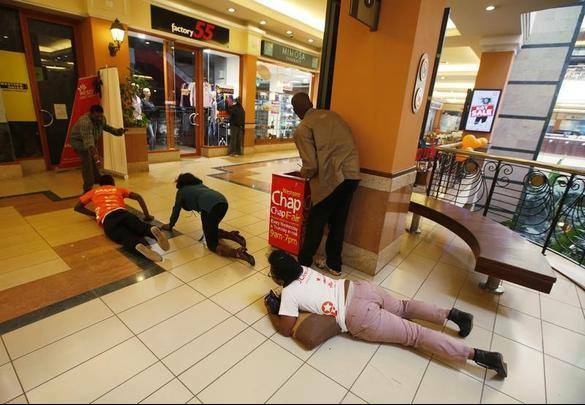 There was some good news on Sunday, as Kenyan media reported that several people in hiding in the mall escaped to safety in the morning, suggesting that not everyone who was inside overnight was being held by al-Shabab. Cecile Ndwiga said she had been hiding under a car in the basement parking garage. “I called my husband to ask the soldiers to come and rescue me. Because I couldn’t just walk out anyhow. The shootout was all over here – left, right- just gun shots,” she said. Police lobbed multiple rounds of tear gas throughout the day at hundreds of curious Kenyans who gathered near the mall. Associated Press reporters Jacob Kushner in Nairobi, Kenya; Josef Federman in Jerusalem; Louise Watt in Beijing; and Cassandra Vinograd in London contributed to this report.